Key Republicans are warning that top officials at the Justice Department could be held in contempt of Congress, and possibly face impeachment, as the agency still has not provided Congress documents demanded by lawmakers. House Freedom Caucus Chairman Mark Meadows, R-N.C., told reporters Tuesday evening that some lawmakers are "seriously considering" contempt of Congress. Meadows has repeatedly griped about the Justice Department's failure to fully comply with a subpoena and hand over 1.2 million documents related to three investigations looking into former Secretary of State Hillary Clinton’s private email server, potential abuses of the Foreign Intelligence Surveillance Act, and the firing of former FBI Deputy Director Andrew McCabe last month. The Justice Department has picked a U.S. attorney in Chicago as the official to oversee the production of troves of documents to Republican lawmakers — something President Trump has pressured the agency to do immediately. The move comes less than two weeks after the FBI revealed it was doubling the number of staff handling the request from House Judiciary Chairman Bob Goodlatte, R-Va.
House Intelligence Committee Chairman Devin Nunes (R-Calif.) said Tuesday that he will seek to "impeach" FBI Director Christopher Wray and Deputy Attorney General Rod Rosenstein if they decline to hand over the document used to launch the FBI's probe into possible collusion between the Trump campaign and Russia's meddling in the 2016 presidential election. A day after Rep. Devin Nunes, chairman of the House Intelligence Committee, threatened the impeachment of FBI Director Christopher Wray and Deputy Attorney General Rod Rosenstein, the Justice Department on Wednesday turned over the document that launched the bureau’s Russia investigation in 2016, cooling the latest confrontation between House Republicans and intelligence community leaders. Nunes, a California Republican, had demanded an unredacted version of the document by Wednesday afternoon, and the Justice Department provided one with a few redactions that it deemed necessary for national security. Nunes praised the cooperation and said the document would aid his committee’s “ongoing investigation” of the department and the FBI. 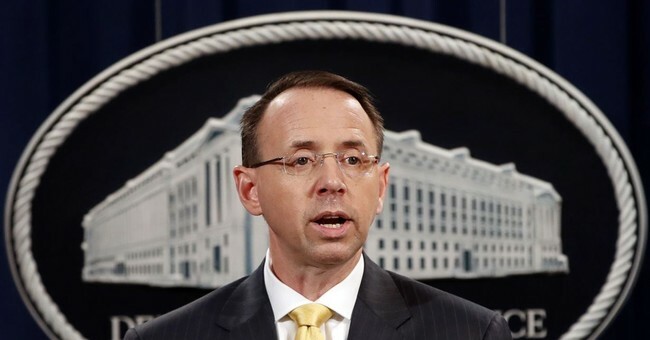 “I’d like to thank Deputy Attorney General Rosenstein for his cooperation today,” he said. Nunes had threatened late Tuesday to seek the impeachment of Wray and Rosenstein if they failed to meet his demands, an extraordinary escalation of tensions that underscored eroding relations between the House Intelligence Committee and the Justice Department.